This update of the hugely successful SE2200A adds switchable polar patterns and a fresh lick of paint! The SE2200A cardioid capacitor mic has been a best-seller for SE Electronics for around 10 years now, so you may wonder why the company have decided to completely redesign and relaunch it as a MkII version. I think the short answer is that SE simply wanted to offer the end user more for their money, to maintain an edge in what is becoming an increasingly crowded marketplace. This new version uses the same hand-built, one-inch capsule employed in the original, but this time with two of the centre-terminated diaphragms instead of one. These are placed back to back, with switching to provide a choice of cardioid, omnidirectional or figure-of-eight polar patterns. 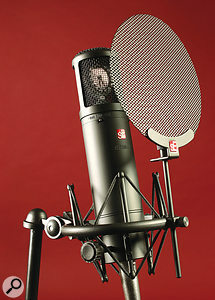 Although the general outline of the mic is little changed, the cosmetics have been updated with a tactile, matte-black, rubbery paint finish, which SE claim helps to damp metalwork resonances. Supplied in a cardboard box lined with heavy-duty foam, the mic will, for a limited time, be shipped with a newly designed shockmount, also finished in black rubber paint, plus a mesh pop screen. The latter fits into the shockmount, thus avoiding the annoying tendency of gooseneck pop screens to droop. The way the mic fixes to the shockmount has also been changed: now, a plastic collar drops into the centre of the shockmount, and the socket end of the mic sits inside the collar. A thumbscrew at the side of the shockmount deforms the plastic collar slightly, locking everything firmly in place. Three recessed mini-toggle switches on the mic body set the polar pattern, engage the low-cut filter, and select from a choice of three pad positions (0dB, -10dB and -20dB). The paper spec details a 20Hz-20kHz frequency response (-3dB), while the sensitivity at 1kHz into 1 kΩ is 20mV/PA. There's a slight presence bump at 10kHz, lending the mic an airy-sounding high end, but this is nicely subtle. An equivalent input noise level (EIN) is specified as 16dBA, which is pretty typical for this style of mic, while the maximum SPL is down as 135dB. If you're concerned about the weight and size of the mic, it comes in at 598g, and has a diameter of 51mm and an overall length of 215mm. That's heavy enough to feel substantial, but not so heavy as to pose a challenge to a typical mic stand! 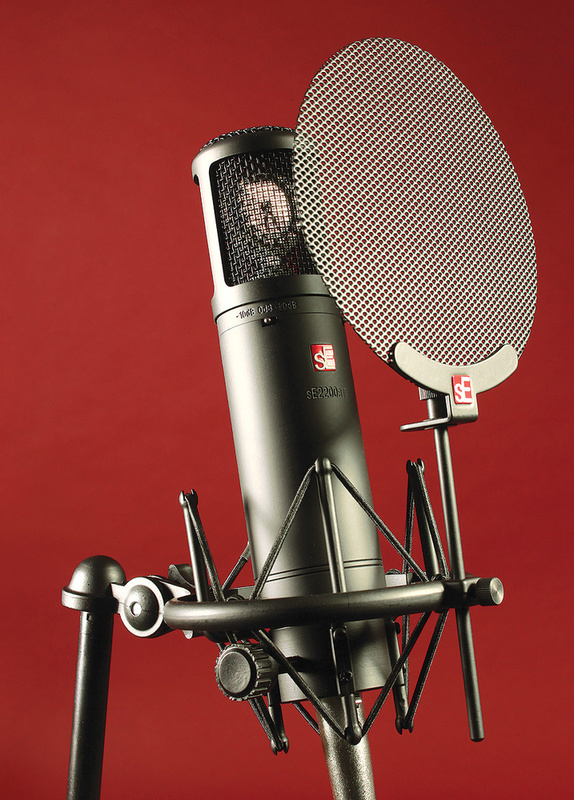 A visual examination of the mic shows it to be very solidly engineered, with a high standard of external finish. The new rubbery paint makes the mic easy to grip and seems reasonably immune to finger marks. This same finish is applied to the basket grille, which, like most mics of this type, is of a double-layer structure with a coarse mesh on the outside and a finer one inside. I like the shockmount rather more than the earlier version, and while it is probably no more or less effective than other elastic-cradle designs, it is very solid, with proper fixings to keep the elastic in place. Its thumbscrew assembly also seems to lock the swivel mount in place adequately without you having to resort to finger-breaking pressure. A second small thumbscrew locks the pop screen's stem in place, so that the screen is securely fixed at the right distance from the mic. I subjected the SE2200A MkII to all my usual tests, including using it on acoustic guitar, electric guitar, hand percussion and vocals. You can hear some audio files comparing this mic with the Audix CX212B and the AT4050 in the online version of this article (/sos/may12/articles/se2200amk2.htm). In cardioid mode, the mic sounds very similar to the original SE2200A, which is hardly surprising given that it uses the same capsule design, although the EIN figure is 1dB better than its predecessor, so some improvement must have been made to the circuitry. It has a fairly natural sound but is capable of flattery, insomuch as it adds a little low-end warmth while keeping the highs sounding sweet. Creating omni and figure-of-eight patterns from a pair of diaphragms doesn't yield quite the same quality of off-axis response as a dedicated single-diaphragm omni or figure-of-eight capsule, but is still perfectly adequate for many applications, as long as you try to keep the main sound source more or less on-axis. I found the general tonality in omni and figure-of-eight modes to be similar to that in cardioid mode, other than the inevitable differences in proximity bass boost — the omni pattern has no proximity effect to speak of, while the figure-of-eight has the most, so the lows appear boosted unless you're quite some distance from the mic. I put the 2200A MkII up alongside my AT4050, one of my favourite all-rounder multi-pattern mics, and was surprised at how similar the two mics sounded. I got perfectly decent results during all of my tests, so if you can only afford one mic at the moment, this would be a sensible choice until you can afford to expand your microphone collection. Given that the SE2200A MkII is selling for well under £300, it offers great value as a vocal mic that can also be pressed into service for other chores. The Audio-Technica AT4050 is an obvious alternative, as it has a similar general character, but the more you look, the more multi-pattern mics you find, so a full list would be impractical here. Offers the same essential character as the original SE2200A, but with multi-pattern capability. Neat shockmount that incorporates pop-screen holder. No cons at the price — although, as with any vocal mic, you need to make sure it suits the voice you plan to use it with. Meet the new boss, same as the old boss — but with multi-pattern capability and a nice new black livery. SE Electronics +44 (0)8455 002500. Fingerprint Audio +1 512 847 5696.